Elegant combination of steel and MDF. Attractive look. Solid and durable. Extra wide design. 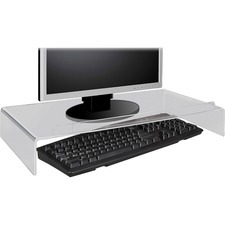 Stand Type: Monitor; Width: 26 7/8"; Depth: 10"; Maximum Height: 3 1/2". Attractive look. Steel band and solid steel legs. Durable MDF platform. Wide design. Stand Type: Monitor; Width: 23 3/4"; Depth: 10 1/4"; Maximum Height: 3 1/2".